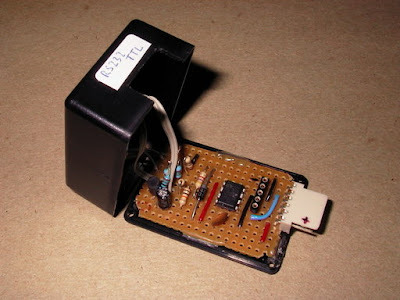 This project is a Microchip PIC microcontroller with an RS232 serial interface on one side and an Infra-Red receive and transmit interface on the other. All mention of RS232 on this page actually refers to RS232 waveforms operating at 5V TTL levels not +/-12V levels which would destroy the PIC device. An appropriate converter between the two must be used. By sending commands on the RS232 interface it is possible to receive or transmit a sequence of bits modulated as a series of on/off states in a 38 kHz infra-red carrier signal. Infra-Red remote controls use a carrier signal (typically around 38 kHz) so that there is no confusion with sunlight etc. The carrier is turned on and off to represent the bit sequences at a lower rate, for example 500 Hz).